The Focus Youth Project in Viewpark recently held its annual presentation evening in St John Paul II Primary School. The event takes place to acknowledge the achievements of the young people over the previous year. The young people were presented with certificates for beginners ski, advanced ski, rock climbing, kayaking, first aid, power boating level one and two, RYA sailing level one and two all linked to the national governing bodies. There were also awards for Youth Achievement and Dynamic Youth, Gold and Silver Duke of Edinburgh Awards. The certificates presented by North Lanarkshire council Jim McCabe, senior CLAD worker Aileen McEachen, RYA instructor Bob Campbell and Focus management committee chairwoman Mary Woods, treasurer Tom Bell, vice-chairman Scott Robertson and member Caroline Todd. There were 10 personal achievement awards presented to: Ben Hammond, Ellie Coster and Craig Guy for first aid, Tegan Leigh Farquhar for rock climbing level one, Chelsi Rogers for power boating level one, Nicole Still for beginners ski, Chloe Whitelaw for advanced ski, Ryan Murray for kayaking one star, Tony Burns for power boating level two and Amanda Dunsmore for RYA sailing levels one and two. Additionally there were two Outstanding Achievement awards presented to Nadine Formosa (16) and Chris Teven (18). Both joined the project at the age of 12 and given considerable service ever since becoming members of the junior Focus committee and volunteering their time to help the next generation. 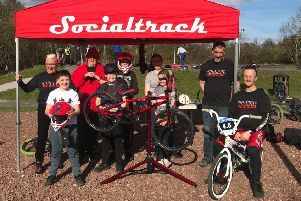 Do you have what it takes to be a world champion as Craigneuk track hosts UK qualifier?